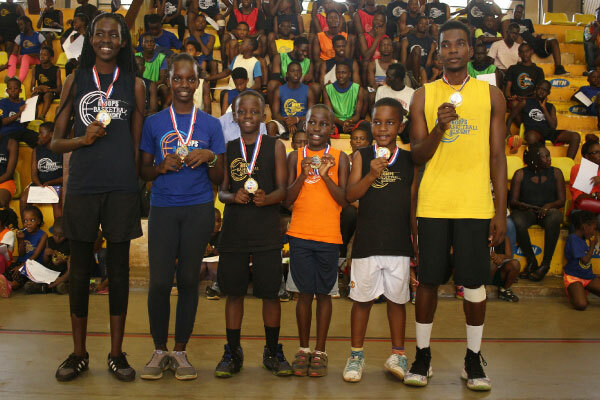 The seventh edition of the iHoops basketball camp concluded at the Lugogo MTN Arena on Friday. For the organisers of the week-long camp, the latest gathering of youngsters marked an improvement in both quality and quantity. “The players that started with us have really shown a lot of improvement. The first camp we had the games were not that competitive and there was very little skill. But they are now outstanding and the future is bright,” Ben Komakech one of the directors stated. Komakech and City Oilers teammate Jimmy Enabu are the directors of the camp that started five years ago and witnessed the number of kids taking part shoot to 190 from 20 after the first camp. “We have a good team of committed people and managers and backing from City Oil who are interested in growing the game. So when you have people like that it makes your work easy,” Jimmy Enabu stated. Enabu also believes the camps offer an opportunity for kids to learn the basics at an early stage something that was unheard of when they were growing up. “What we are doing now we didn’t have a chance to do. The information we have now is the same we are providing. The kids have a chance to be even better. We want the kids to show a lot of skill going forward. If we keep having more camps the more they will get better,” he added.